The first iPad reviews are out, but none of them tackle the most critical question to ask when purchasing this new device: What are you going to carry it in? Action Treadway: The pad pack looks like a clever messenger-style case with a leather folio cover attached on a swivel. You can carry your iPad by your side, or flip open the cover and use it in any orientation you want. A price and shipping date have yet to be announced. Apple: We figured this one went without saying the first time around, but our readers are right: it’s still worth mentioning. Apple’s quaintly named iPad Case ($40) is a protective cover with some clever built-in stand functionality. Fold the cover just so, and the iPad Case can act as a photo stand or a just-enough prop for notebook-height typing. Available in black, the iPad Case ships mid-April. Brenthaven: This popular case manufacturer announced four iPad cases for pre-order; the first ship on April 3, with the others shipping in May. The $35 Bill-Fold iPad Sleeve is a slim protective sleeve. The $25 Ecco-Prene iPad Sleeve is available in Black or Pink. The $20 Mini Eclipse Sleeve for iPad, available in Burgundy or Silver, is a hand-carried messenger case with a ballistic nylon shell, retractable handles, and a pocket for the power brick. The $40 Switch iPad Satchel in Gray Gi Jo/Natural or HWY 99/Amsterdam is a vertical messenger case with pockets for extras; a reversible flip-it-and-clip-it flap that lets you quickly change the look of the bag. Case-mate: Case-mate has hit the ground running with five iPad cases, starting with the $35 Express iPad Nylon Flip Case, a slim, splash-proof folding sleeve with a magnetic enclosure. The $40 iPad Gelli Case is a flexible, plastic-like skin for the back of your iPad, available in a variety of colored patterns. The $40 iPad Hybrid Tough Case is a dual-layer skin with a silicone wrapper on the inside and hard ABS plastic shell on the outside for strong impact resistance. The $50 Traveler iPad Felt Folio Leather Case is—you guessed it—a folio case with pockets for a notepad, business cards, pens, and other trinkets. It also includes a “magnetic strap” (whether it's a shoulder strap is unclear). Finally, the $80 Walkabout iPad Leather Folio is a genuine tan-leather case with a fold-open top. All five bags are available for pre-order, although pre-orders of the Hybrid Tough Case are currently sold out. Casecrown: The $35 iPad Air Cell Padded Briefcase is a general-purpose messenger-style case, available in three colors, with handles and air cell—you could even call it bubble wrap—padding. The $20 iPad Neoprene Case is a standard-issue vertical sleeve, available in four colors. The $25 iPad Neoprene Pocket Case takes a horizontal style and is available in the same four colors as the neoprene case. The $40 (currently on sale for $20) iPad Suede Slip is a messenger-style case with faux suede exterior, a small external pocket, and a detachable shoulder strap. 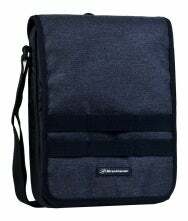 Finally, the $69 (on sale for $35) iPad Vertical Mobile Messenger Bag is a beefier vertical-messenger case with room for some books, magazines, and other accessories. However, the product page strangely speaks of carrying both an iPad and “your laptop,” so it might not be custom fit for the iPad. Colcasac: The $35 Colcasac iPad Case is hand-made in Salt Lake City; it provides a small outer pocket for trinkets and is available in a variety of colors and print patterns. 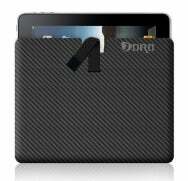 DRO Concepts: The $120 Carbon Fiber iPad Case is a horizontal sleeve that's actually hand-crafted out of carbon fiber. The sleeve has a neoprene lining and a strap for securing your iPad, and is available for pre-order. Essential TPE: The $25 Vivid Protector (AG) iPad is a protective, anti-glare film for the iPad’s display. The $35 Ultra Protection Sleeve is an EVA-foam sleeve with a velcro strap for securing your iPad and an ultra-soft interior lining. The $30 Puff Sleeve|S, available in three different colors, has a thick, splash-proof outer shell—that looks much like a puffy winter coat—made of foam and neoprene. Fabrix: This gadget case maker is now shipping a number of slim, padded sleeves with various unique designs. Each is made to fit inside an existing notebook case, and though the official price of each is $30, they're currently selling for $20. Fusion of Ideas: According to the company, the $65 StealthArmor iPad, available now, is developed from materials that were “originally designed for high performance automotive racing applications.” The StealthArmor is a protective finish that includes a clear panel for the iPad’s display and your choice of colored finish for the back of the device. Happy Owl Studio: The Wallet and The Clutch are protective book-sleeve-like covers that offer just a smidgen of extra storage space. The Clutch has an expanding folio under the cover with a couple pockets that, in the company's words, “hold everything the modern woman needs on the go.” The Wallet—essentially The Clutch with an aesthetic for the guys—looks like Apple’s iPad Case with similar "essentials" pocket. Prices and availability have yet to be announced. iKit: The $25 iPad Drop Case is aprotective, rubber shell available in a variety of vibrant colors. The $40 iPad Leather Folio Case is like a Trapper Keeper for your iPad, but with a more "executive” style in black or grey. Both items are available for pre-order. iWrap: The $30 iWrap Full Body Wrap for iPad is scratch-proof film protection that, as the name says, covers both the iPad’s display and its aluminum backside. The Wrap is available for pre-order. Kensington: The $10 Reversible Sleeve is a budget-minded neoprene sleeve originally designed for 7- to 10-inch netbooks and the big Kindle, but the company says it fits the iPad, too. The Sleeve is reversible (black on one side, grey on the other) and has a fold-over flap closure. Nedrelow: The $89 Book is a handmade iPad case that looks like a hardcover book jacket; it's designed to be shelved, easily stowed in any bag, or carried for the ultimate nostalgic feel. It comes in your choice of three cover print styles, and for an addition $5 you can add your own text. The Book ships in four to eight weeks. Newer Technology: A well-known Apple accessory maker, Newer Technology has announced four iPad cases so far, though none are yet listed on the site. The $10 NuVue Clear Screen Protector is a protective film for the iPad's display. The $18 NuGuard Soft Silicone Protective Case is a slim sleeve available in six colors. The $25 NuGuard Hard Shell Protective Case is a tougher protective shell available in clear (for optimum iPad flaunting) or bycast black leather. Finally, the $40 NuVue Screen Protector with Privacy Shield is a protective film for the iPad's screen that prevents others from looking over your shoulder. Quirky: The Cloak, currently available for pre-order for $42, is a slim, folio-style case that resembles an office folder. Built from non-slip rubber with a plastic hinge, and available in a variety of gadgety colors, the Cloak can also act as a stand—in both portrait and landscape orientations. Substrata: Substrata’s wood iPad Case and iPad Box are unique cases available in a variety of woods including African mahogany, maple, walnut, zebrano, and wenge. The Wood Case is a shell design that protects the iPad’s back and bezel, while the iPad Box gains a flip-up lid that also protects the iPad’s display. No prices or shipping dates are listed, as the designs are still being finalized, but Substrata has posted a photo gallery and you can sign up to receive e-mail updates. TrendyDigital: The $20 WaterGuard Waterproof case for iPad is basically a giant, multi-touch-friendly plastic bag for your iPad. You can still use an iPad’s touchscreen and Home button while it's enclosed in the UV-stabilized plastic, and an adjustable shoulder strap makes it easy to tote the case. Vaja: In addition to the Retro Slim Jacket we mentioned in our previous roundup, Vaja now offers the $150 ivolution Top and $170 ivolution Top SP cases. (Unfortunately, Vaja’s Website design prevents linking directly to products: Click the above link, then click Products, then click iPad.) Each offers a protective shell featuring Vaja’s trademark premium, customizable leather, along with a removable cover that attaches to the case's backside while you use your iPad; the SP model adds a sporty trim stripe. You can pre-order the ivolution Top and Top SP now. Vers: The $80 Wood Case for iPad is hand-crafted from solid hardwoods and bamboo, steel reinforced, and has an optional wood stand for propping up your iPad. The Wood Case is not yet available for pre-order. Wrappers: The No Logo Sleeves, priced from $27 to $49, are slim, vertical sleeves with elastic bands that can hold the iPad securely on the outside during use. They’re available in a wide variety of colors, materials, and prints. XGearlive: The $50 Shadow for iPad is a snap-on plastic shell with a carbon-fiber-looking finish. A handful of manufacturers have announced cases in one way or another, but have not yet provided any information on their Websites. Uniea: Longtime iPod and iPhone case maker Uniea has announced three iPad cases: the Omniverse, the U-Sleaf, and the U-Skin. The only details currently available can be found in this YouTube promo video. 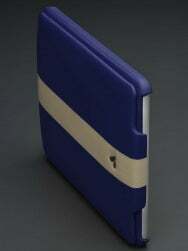 Speck: A good number of readers have asked about Speck iPad cases. While no information is yet available on the company's Website, Speck has told Macworld that a number of products are on the way, and we've already received a sample of the company's PixelShield iPad carrying sleeve. Ozaki: Previously a maker primarily of electronic accessories for the iPod, the iPhone, and computers, Ozaki has told Macworld that the company is toiling away on a number of iPad cases, but we currently have no other details.